Lynnette Rau Milleville is the owner of Nutmeg Farm and the director of the Nutmeg Farm Dog Sport Center. The farm raises sheep, pigs, chickens, and cattle for sale to those wanting local farm produce. The Dog Sport Center offers lessons in pre-stock herding training and on-stock training focused on the natural talents of each herding breed. Herding training at the farm is international in nature. Lynnette specializes in British, German, Australian and New Zealand techniques. Her background in showing and training horses has greatly influenced her training methods. 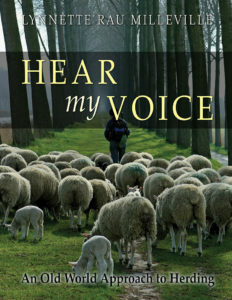 She has trained with several shepherds in Great Britain and Germany. Besides offering lessons, the center has sponsored AKC, AHBA, and ASCA sanctioned herding trials along with other competitive dog events. In 1988, Lois Russell and Lynnette petitioned the American Kennel Club to include herding events under the performance division. Lynnette was tasked with authoring the trial competition and testing divisions of the AKC’s incipient herding program. It was her desire to encourage the nurturing of herding talents that had become dormant in many AKC recognized herding breeds. She remains an active AKC herding judge. 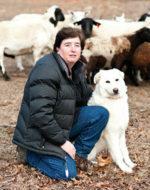 Lynnette has competed and won numerous herding trials in the USA, Canada, and overseas. In Summer 2014, NUTMEG FARM, was featured on an episode of Too Cute! Currently living with Lynnette and her sons, Matthew and Mark, are several Border Collies, a Spanish Water Dog, and a livestock guardian dog. Past house guests include German Shepherds, Briards, Australian Shepherds, Australian Cattle Dogs, Shetland Sheepdogs, a Belgian Shepherd, a Beauceron, Collies, a Bearded Collie, and numerous others. When not training dogs or working on the farm, Lynnette can be found on local tennis courts playing Tennis or Pickleball. At other times she can be found playing hand percussion with local bands, riding performance horses, or studying Aikido.